This guide details steps to install, uninstall, and upgrade Developer Studio that you may have installed using different methods. Developer Studio 12.0 is supported for use with a range of operating systems, architecture, and Java developer kit combinations; for a complete list, see https://access.redhat.com/documentation/en-us/red_hat_developer_studio/12.0/html/supported_configurations_and_components/index on the Red Hat Customer Portal. Red Hat OpenJDK is recommended. To configure Developer Studio to use OpenJDK, follow the instructions at Working with JREs. If you install Developer Studio on Windows in a folder accessible to all the users (example: c:\devstudio), this DevStudio instance can be used by all the users. However, if the main installation folder is not writable by a given user, any newly installed feature and update gets saved inside the user’s home directory. Developer Studio for Eclipse packages the Developer Studio plug-ins for your existing Eclipse instance. 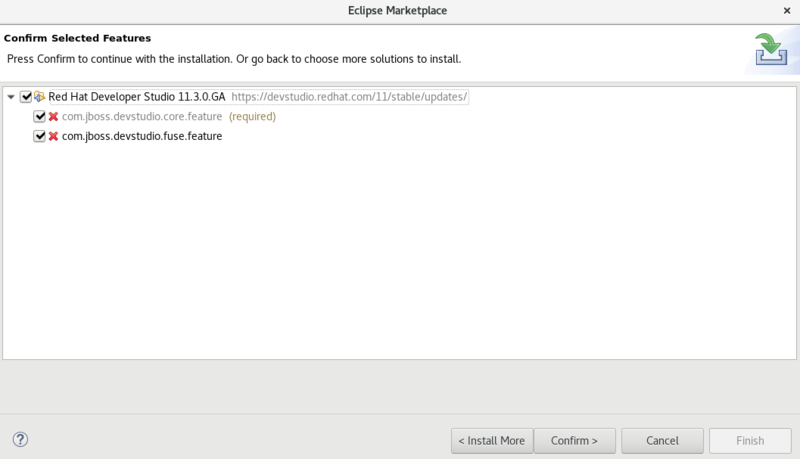 You can either install Developer Studio from the Eclipse Marketplace when you are online or use the Update Site Zip to install it when you are offline. Developer Studio is available to install from Eclipse Marketplace when you are online. If anytime before or during the installation, you are asked about selecting additional features to install, you may select Fuse Tooling to use the Fuse tooling features after the installation is complete. Click Help > Eclipse Marketplace, locate Red Hat Developer Studio 12.0 GA, and click Install. You need the Update Site Zip to install Developer Studio in Eclipse in the offline mode. Alternatively, you can also use an installer downloaded on your system instead of the Update Site Zip to install Developer Studio in Eclipse when Offline. Note that the Target Platform Zip contains the features on which DevStudio depends. It also contains the sources of all the included plugins. You can download the Target Platform Zip from https://devstudio.redhat.com/12/stable/updates/. You must first be online to download the .zip file before proceeding to install Developer Studio in Eclipse in the offline mode. Download the Red Hat Developer Studio 12.0 Update Site Zip from https://devstudio.redhat.com/12/stable/updates/. From the table of components, select Red Hat Developer Studio 12 - Bring Your Own Eclipse and click Next. Developer Studio stand-alone packages the Developer Studio plug-ins with Eclipse and dependent third-party plug-ins in an installer for all operating systems. The installer provided to install Developer Studio stand-alone is available from a variety of sources, including the Red Hat Customer Portal. Download Red Hat Developer Studio 12.0 Stand-alone Installer from Developer Studio Software Downloads. This section describes steps to install Developer Studio using a script and to build the Red Hat Developer Studio installer from the source code. Use the scripted method to install Developer Studio stand-alone using the GUI once and then a generated script for subsequent installations. This installation method enables simplified repeat installations or installations in bulk without stepping through the installer GUI for every installation. The Developer Studio stand-alone installer is available from a variety of sources, including the Red Hat Customer Portal. Follow the on-screen instructions to complete the installation process. After the installation is complete, an InstallConfigRecord.xml file is generated in the Developer Studio installation directory. You may want to uninstall a specific version of Developer Studio if you have concluded development in one version, say 11.x, and you now want to install a newer version, say 12.x. However, you can have more than one version of Installer-installed Developer Studio or Eclipse-installed Developer Studio on your system, provided you have these versions located in different directories. Ensure that Developer Studio is not running. On the command line, navigate to path/to/Developer Studio/Uninstaller. Click the Force the deletion of <path_to_Developer Studio_directory> check box, to remove the entire Developer Studio installation directory. If this is not selected, Red Hat Developer Studio will be uninstalled but some files will be left as is in the installation directory. 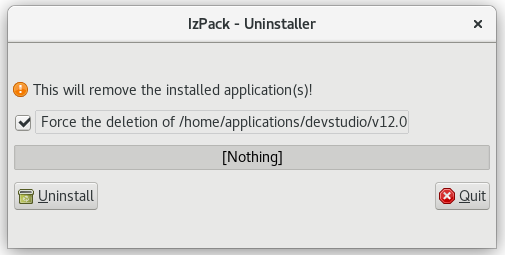 Developer Studio can be uninstalled using the following steps regardless of whether it was installed via Eclipse Marketplace or the update .zip file. In the Eclipse Marketplace window, Find field, type Red Hat Developer Studio and then click Go. Click Installed in the Red Hat Developer Studio <version> section. In the Confirm Selected Features window, ensure that Red Hat Developer Studio <version> is selected and click Confirm. Depending on your need, refer to the respective sections to upgrade Developer Studio. Each major version of Developer Studio is based on a different version of Eclipse. As a result, it is not possible to update an older major version of Developer Studio to a newer major version. For example, it is not possible to update a devstudio 10.x installation to 11.x, nor is it possible to update a 11.x installation to 12.x. However, it is possible to use the workspaces created using Developer Studio 11.x with Developer Studio 12.x. You can update your Red Hat Developer Studio to the latest minor versions within the major release. For example, you can update your Red Hat Developer Studio 11.1 installation to 11.2. You may be automatically notified by the IDE when the Red Hat Developer Studio 11.y update is available, depending on your IDE settings for automatic updates. In the Available Software Sites table, ensure the URL https://devstudio.redhat.com/12/stable/updates/ is listed or, if not listed, add it. For any Red Hat Developer Studio updates found, follow the on-screen instructions to apply the update. Red Hat Developer Studio and JBoss Tools allow users to report issues as they are encountered from within the IDE . It is recommended that users report issues frequently and include as much detail as possible to help the development and testing teams replicate and fix the issue. The Report Problem wizard creates a zip file containing the relevant IDE log files. This zip file can be attached to the JIRAs submitted against each problem to provide context for the issue. What you wanted to do with Red Hat Developer Studio?